A CAN/LIN communication analyer and data logger "LE-270AR"
which can send a test data. 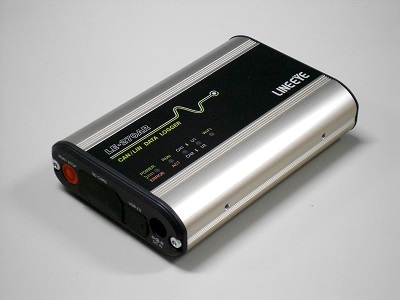 LINEEYE Co., Ltd released an analyzer/data logger of CAN/LIN communication "LE-270AR". LE-270AR has a simulation fucntion with which you can send an arbitrary data and also can be used as a data logger which supports data logging to a SD card. Many customers of the conventional model "LE-270A" requested a model which has a simulation function in which they can send a test data to a communication line and a function with which they can monitor the logged data without stopping the logging. Now LINEEYE Co., Ltd releases a new CAN/LIN analyzer "LE-270AR" with which by Wi-Fi you can monitor the log data in a SD card by inserted into the LE-270AR and also you can send a test data to a communication line by using simulation function when it acts as analyzer. When connected with a PC, LE-270AR acts as a CAN/LIN protocol analyzer with which you can monitor a communication data in real time . It has High-speed CAN interface and LIN interface and you can select CAN (TJA1050) or LIN (TJA1021) for the each channel depending on the test condition. When registering CAN/LIN communication data, analog/digital signals from 4 external input terminal can be registered at the same time. It supports automatic measurement of a specific time and has Instant Power Failure Prevention circuit as the previous model. It is useful for a vehicle testing or embedment into a testing line. Measurement of 2 channels of CAN, 2 channels of LIN, or 1 channel each for CAN and LIN is available. The Pass/Cut filter and trigger function make your analysis efficiently. By using Wi-Fi You can confirm the measurement log file without stop the logging. In logger mode, it supports DC-IN or 1 pin BATTERY terminal of measurement connector for power supply. Scheduled measurement with start/stop time and automatic measurement by power on/off are available. Automatic fixed display offers real-time display of data frames of same ID in appearing order on a single line. By manual simulation function, you can select a CAN/LIN data registered in advance on PC and transmit it repeatedly. Back up control for sudden power failure prevent the files from a power failure which happens while it accesses the SD card. CAN: Comfort to ISO11898 standard, TJA1050. Measurement processing part such as USB connector/SD card slot is isolated by galvanic isolation. Standard/ Expansion format. Support bit timing settings. Frame breaking is possible according to the data length of each ID or specified idle time. Record specific frames using Bit-mask ID, Bus ID (up to 8), Cut ID (up to 8). Data string up to 8 characters, specified remote frame (CAN), frame error (LIN), timer and counter, logic status of external signal, external trigger input. Stop measurement (offset can be set), validates/invalidates trigger condition, control timer/counter, turn on/off the light of user-defined LED, output external signals, output trigger signals, Transmits CAN data (when in manual mode). - Registers acceleration data of X/Y/Z axes. 3 axes acceleration sensor (equivalent to KX022-1020-FR) is built-in. - Registers and displays latitude, longitude, and above sea level. SMA (female) connector for active GPS antenna is equipped. Convert data into Text, CSV, or KML format and save. Mini-B connector. High speed supported. External DC power (DC8-36V), AC adapter (6A-181WP09, center plus). *1: Only “Hr:Min:Sec”, “Min:Sec:x1ms”is available on Analog mode. *2: LE-270AR does not support GPS. *3: Wi-Fi function is valid only in Japan, USA, and Canada.